University Locks is a modern, high quality student accommodation in Birmingham’s new quarter, Eastside Locks. The £30m Alumno development consists of 659 student bedroom across 3 buildings. We were contracted to install a BS 9251 residential fire sprinkler system to Block C on behalf of HE Simm. Sprinkler protection was provided to all cluster apartments/bedrooms within the 17 storey high rise tower. Sidewall sprinklers heads were installed where required with other areas using ceiling mounted concealed sprinkler heads. 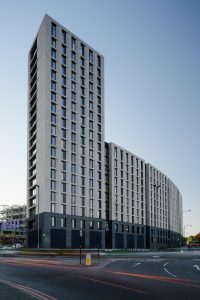 The student accommodation opened to students of the University of Birmingham in September 2016.